I love mango pudding and always order it when I have yum cha. What is your favourite dessert to order? Hubby’s is Dofa fa (A soy bean/curd type soup). Now I have made mango pudding he is asking for me to make Dofa fa. I am not sure, which really means NO, as I don’t really like Dofa fa at all and love mango pudding. 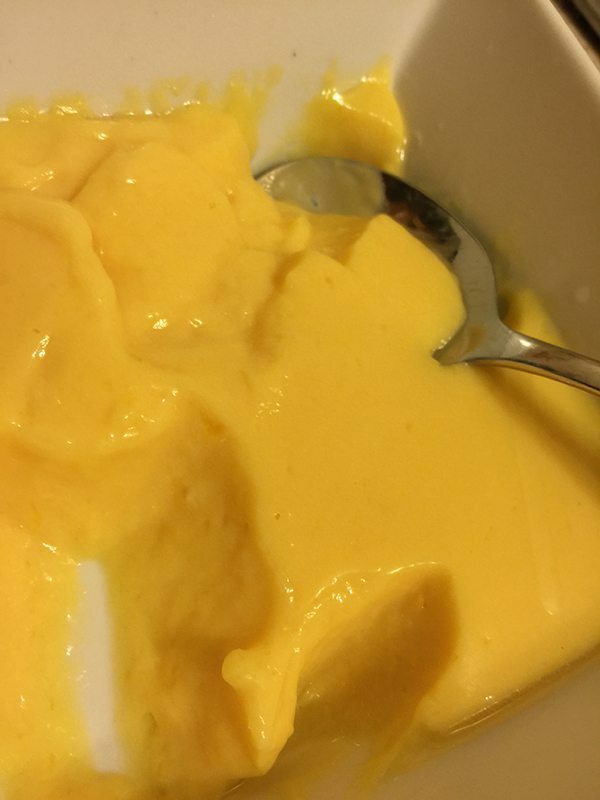 Nothing finishes off a nice meal than a lovely pudding and if it is Mango Pudding it is even better. Especially when it tastes of such lovely sweet and tasty mangoes. 4 to 6 very ripe mangoes. I used 5. Peeled and diced, or 5 cups of frozen mango bits (make sure they are thawed before you start) If you can getting very fresh mangoes makes it even tastier. Containers or bowls for the mixture to set in. 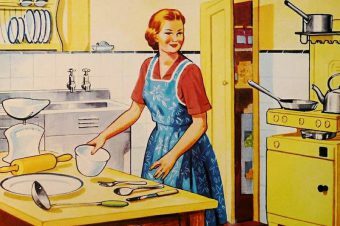 If you wish to remove and serve on a plate for a party you can spray a little bit of oil so that the pudding comes out easily. In my recipe I have it listed 2 envelopes of unflavoured gelatin or say 4 and half teaspoons. I purchase McKenzie’s Gelatine Leaves which are sheets of gelatine and therefore could not put it in a teaspoon as it was not a powder. 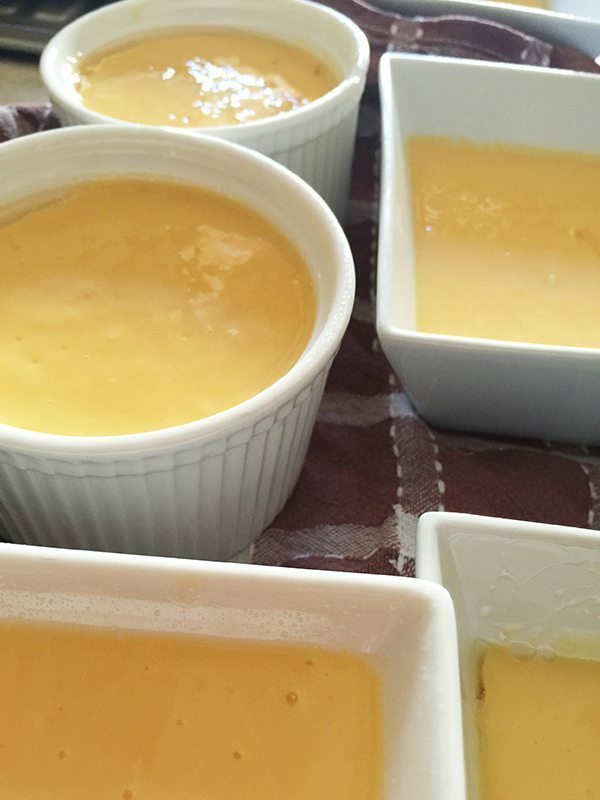 I looked online and found that the McKenzie’s website had a recipe for pannacotta which would have a similar consistency as the mango pudding and it listed to use 6 sheets. I used 6 gelatine leaves and it came out very nice and firm, but I think if I used another 2, so 8 sheets in total it would have been very firm like the ones at yum cha. I should have used the powder and will so next time. 1. 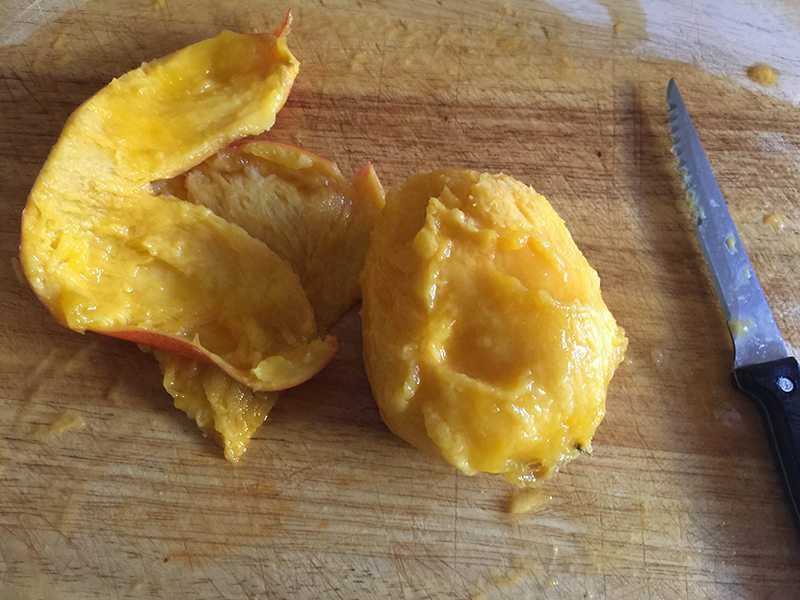 I cut up my mangoes first and put all the flesh into a bowl and discarded the peel. I could not help myself but had to have a bit of some as I made this. The smell was overwhelming (the kitchen smelt devine!) and just reminded me of home, Queensland and being a kid. I love mangoes! Make sure that you put the mangoes in a food processer and make them all smooth. I used a stick blender to zap the mangos and it worked a treat. 2. Once all the mangoes were sorted I tidied up my mess as mangoes seemed to go everywhere. 4. I got the gelatine sorted. If you have the gelatine leaves you need to soak them in half a cup of water to melt them a bit and then zap them in the microwave until they have melted. It is best to have them in bowl that can go in the microwave and make sure that after a minute of soaking that you only put the gelatine in the microwave for 10-20secs at a time. This will make sure that you are not boiling the mixture just melting the gelatine. 5. Add the condensed milk and then the gelatine to the mango mixture. 6. Add mixture to your containers and then put in the fridge for 2 hours to set. If you are making this for a party it might be best to do it the day before, this way you will ensure that the puddings are set and there is no need to worry. All ready to set in the fridge. Mango pudding will be my dessert tonight! Tasting the finished product. It tasted amazing and so mangoey. Loved it and will give it another go. 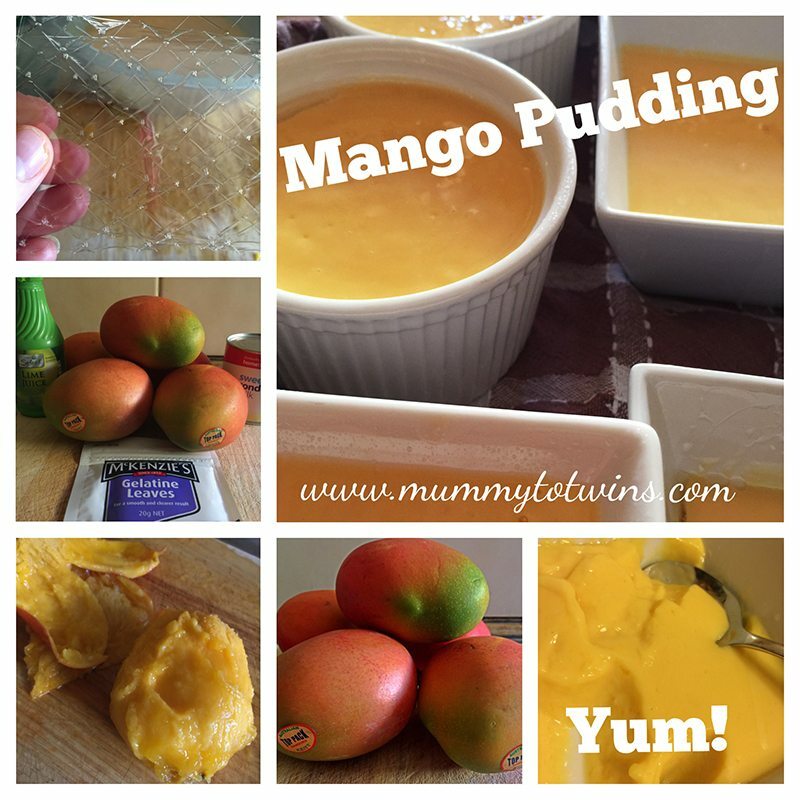 I was very happy as it was my first attempt at making Mango Pudding. Stay current with all the things that are happening on Mummy to Twins Plus One? 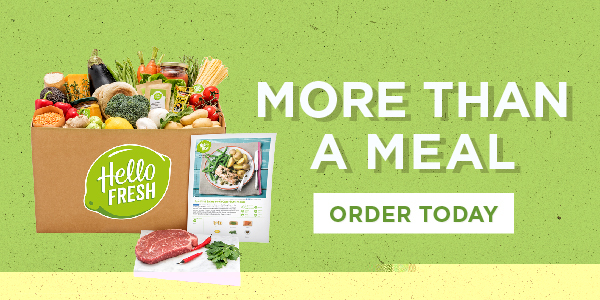 Don’t miss a thing by signing up for my newsletter. This newsletter will list all giveaways and fabulous things that are happening. I am DROOLING just looking at these photos. I love mangos and love condensed milk so this is definitely one for us! Yes it is super yummy and the kitchen smelt amazing with all the fresh mangoes. Make sure you get the powder gelatine as I did not put enough gelatine leaves in. It worked well but think it needed to be firmer. Enjoy.